It goes by many different names: Snow, Dust, Rock, Coke, Blow, but is most commonly known as cocaine. Cocaine may not seem to be as popular as it once was, but it is definitely still being used. In fact, it is estimated that there are 22 to 25 million people that have tried cocaine at least once. It is also believed that there are over 2 million people in the United States that are addicted to cocaine. With each passing day 5,000 more people will experiment with this drug. Cocaine can kill. It causes heart attacks, seizures, strokes and respiratory failure, not to mention the high risks of contracting diseases such as hepatitis, HIV and AIDS from sharing needles. With the seriousness of this epidemic, it is crucial that everyone be familiar with the signs of cocaine abuse. Listed below are 5 of the most common symptoms and behaviors that come along with the use of this drug, that should raise a red flag for immediate attention. As outlined in this video, cocaine addiction can be a trap that one cannot get out of. Sudden financial problems: Someone who has developed a cocaine habit will quickly go through any money that they have. They will also begin to use up money that should be going to bills and other expenses. Cocaine is an expensive drug, and it isn’t uncommon for an addict to go to extreme measures in order to get their fix. If a loved one begins asking for money frequently, when they didn’t previously have financial problems, this should raise a red flag. Struggles with school/work: Using cocaine not only consumes the addict’s time and attention, but it also affects the brain and body. When a person is using cocaine, their cognitive abilities will begin to deteriorate. They may begin to struggle with school, or even skip school classes. They may have trouble at their place of work, such as tardiness or not showing up at all. Their quality of work may also be affected. If the person suddenly gets fired, this should be a reason for concern. Hanging with a different crowd: Once a person becomes hooked on cocaine, he will most likely begin hanging around others who do the same. Drug users enjoy the company of other drug users because they are not going to feel judged, as they may with friends who do not use drugs. Displays of strange behavior: Cocaine is a stimulant. When a person is high on cocaine, they have the tendency to talk very fast and move quickly as well. They seem to have a tremendous and sudden amount of energy. They may also experience moments of paranoia or panic attacks, accompanied by heavy sweating and chest pains. These behaviors will usually seem out of nowhere or unjustified, and are a common side effect of using cocaine. Nose bleeds/bloodshot eyes: Some of the more obvious signs are manifested right on the user’s face. They may look dazed, with bloodshot eyes. They may also have heavy bags under their eyes from long periods without sleep. 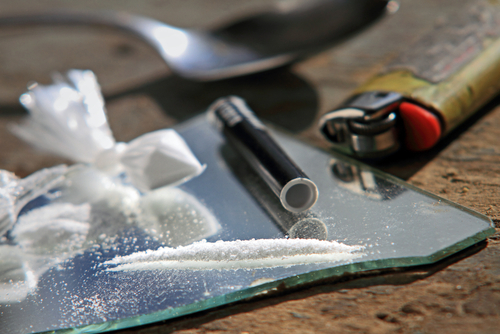 Cocaine is typically snorted, which results in damage to the tissue within the nose. Nosebleeds are a very common indicator that someone has been snorting drugs. Cocaine addiction is very serious and it needs the attention of professionals. When someone is addicted to a drug like cocaine, it is extremely difficult for them to quit by themselves. Love and support through the recovery process is the best way to help an addict.